Tris Villa, 460 square meters of plot size offers a fabulous and comfortable villa where you can be impressed with pool and lush garden views. Tris Villa provides fully furnished villa with 2 bedrooms including 2 en suite bathrooms, 1 shared bathroom, private swimming pool of 4 x 10 m., modern kitchen in Western style, an open living room, and a dinning room. 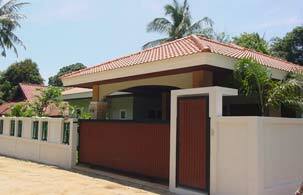 This villa is available for freehold or leasehold. Other amenities and facilities include 2 air-conditioners, telephone line, car park, Jacuzzi, terraced, BBQ area, ceiling fans, hot water system, water storage and pump and termite protection. However, the construction will be completed in August, 2007. With a good location, it is conveniently accessible to Nai Harn beach within 10 minutes or Patong shopping centers within 30 minutes. Give yourself the pleasure of a splendid holiday of pampering at Tris Villa where your complete relaxation awaiting you with a truly convenience, high quality house and tranquil atmosphere. It is an experience you will not forget.